0322_evlo_evmbfirefolo0271: Singles: News-Editorial: Award-Winning Evansville Photographer: Molly Bartels specializing in editorial, wedding and art photography in Evansville, Indiana. 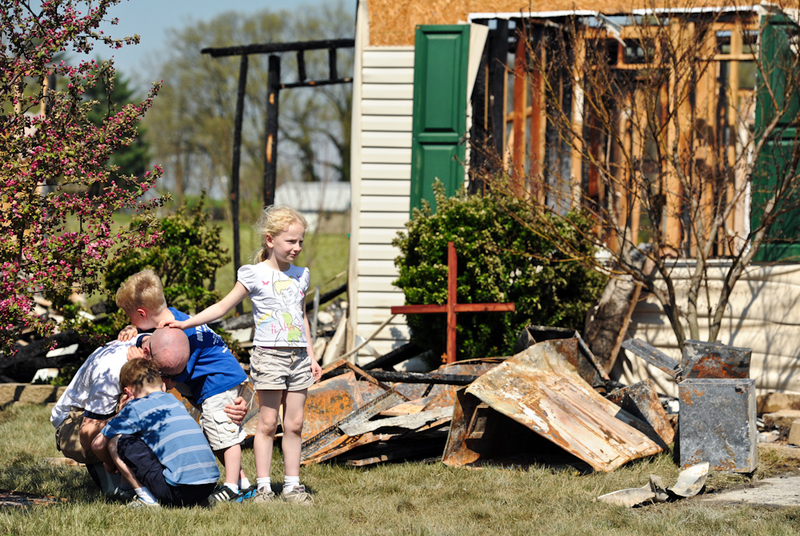 Gabe Lambert grieves the loss of his grandfather, with his children, Luka, 8, front, Anson, 6, back, and Mya, 7, right, at the site of house fire at 738 Strawberry Hill Road in Evansville on Wednesday, March 21, 2012. Donald R. Lambert, 81, perished in the fire that destroyed his home and his neighbor's home and damaged several others in the neighborhood. Lambert's son, Greg, not pictured, made and placed a cross to honor his father in front of the destroyed home.